This weekend, we took a ferry trip to Bainbridge Island, an island in the Puget Sound near Seattle. I was driving the rental car, and my husband was in the passenger seat. The wheelchair and the luggage were in the trunk. As we pulled up to the ticket booth, I saw that there were price reductions for both disabled people and seniors, so I announced us to the ticket seller as one passenger vehicle, one disabled person, and one senior. He looked from one of us to the other, clearly suspecting a scam. “Which is which?” he asked. I held up my state-issued disabled parking permit. Ticket seller: “Wait, I didn’t see that you have those.” He gestured to the hand controls. But for some reason the hand controls convinced him to give me the lower price. Then on the ferry they yelled at me for not letting them know that I had a wheelchair so that they could arrange the car loading for access to the elevator. On the return trip, we had no problem getting the discount, no ID or wheelchair examination necessary, and the ticket seller radioed the ferry crew to let them know I was coming. WSDOT, work on that whole consistency thing! I emailed WSDOT about my experience, and received a very nice response from ADA Accessibility Coordinator Susan Moriarty. Ms. Moriarty satisfied me that the ticket seller I encountered was a loose cannon, and that Washington State Ferries is serious about accessibility and customer satisfaction. That’s a riot! You’re right to call WSDOT on their lack of consistency. But in the end they got it right. 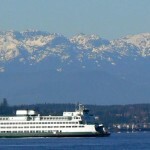 You had a lovely weekend for a ferry trip across Elliot Bay.